The mat says 'aloha'. 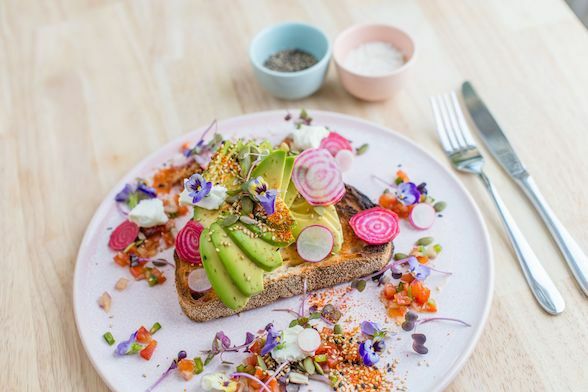 You can't miss it because the cafe is in a prominent position on the corner of Swan Street and Lennox Streets, Richmond. It's pastel pink with all the windows opening up onto the street and there's plenty of outdoor seating. 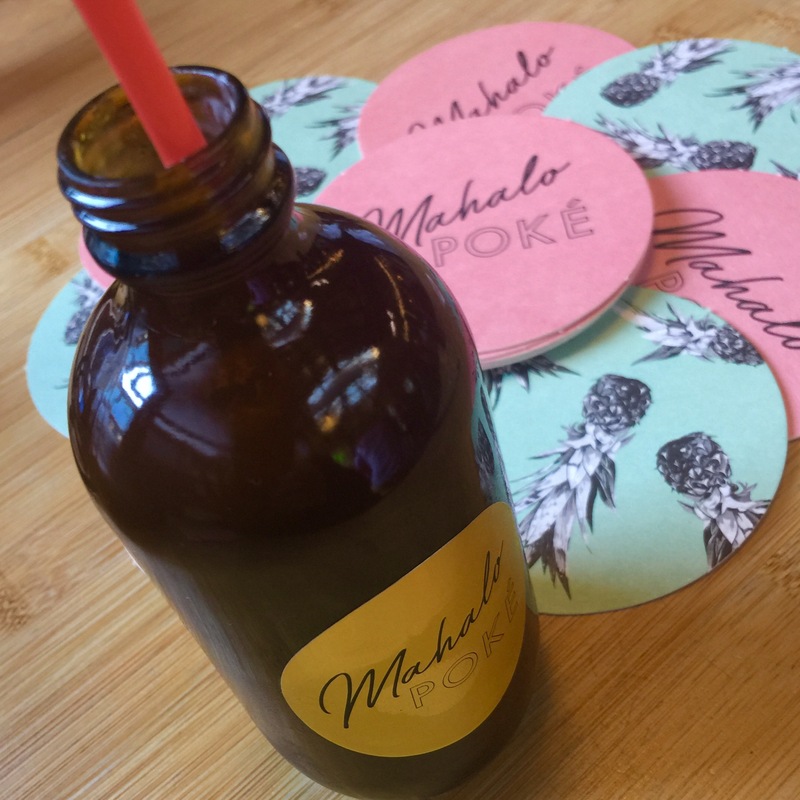 Mahalo Poke is the type of eatery that you go to if you want a nutritious meal in a hurry, or if you don't want stodgy takeaway food. This comment is not to underestimate the quality of the food, because I definitely plan to return. 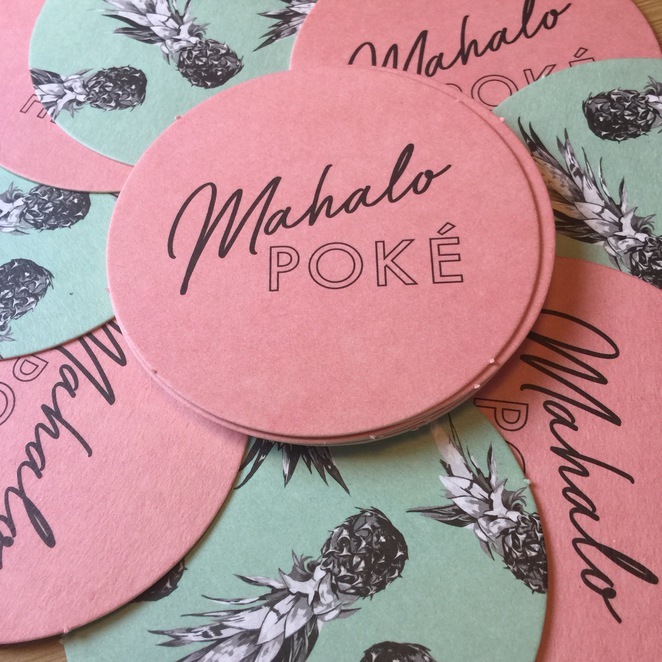 Mahalo Poke is a new Hawaiian food venture from the team behind Botherambo, also on Swan Street, Richmond. They are a reputed cocktail bar and restaurant and known for its Southeast Asian cuisine. Poke is a sashimi salad bowl filled with all sorts of gastronomic delights. 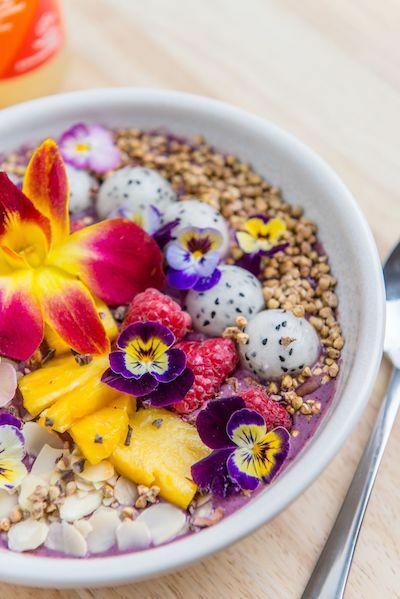 This healthy Hawaiian food trend has hit Melbourne with a storm. 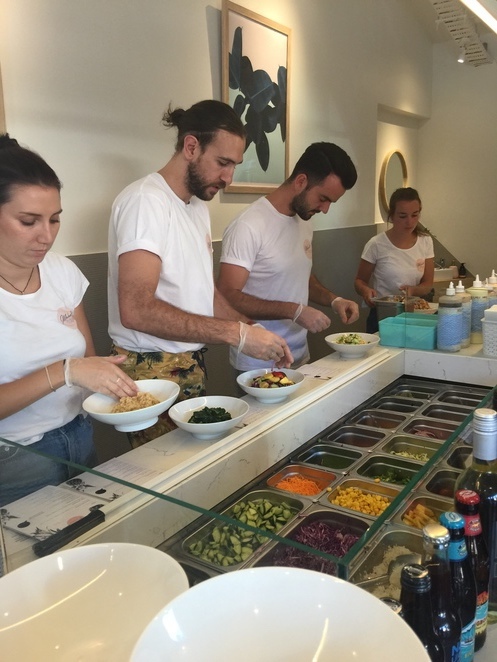 Heavily influenced by Japanese sushi, the bowls often consist of raw fish and raw vegetables. 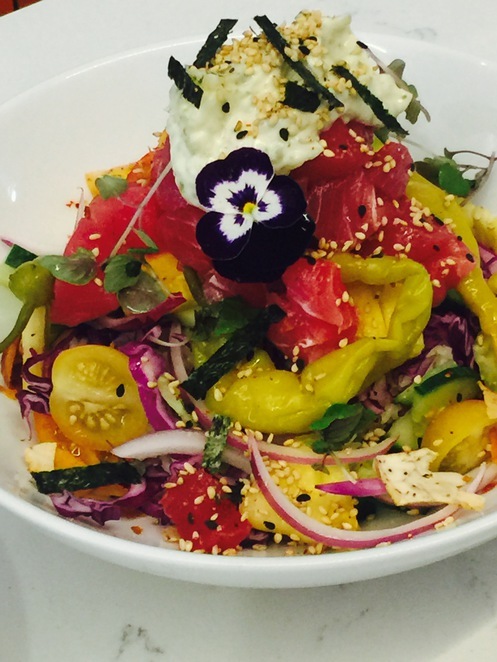 At Mahalo Poke, they are ornated by edible flowers and are dressed and garnished with style. You can build your own bowl or pick from one of the signature bowls. First, you choose your 1 base from the following selections: Kale, brown rice, jasmine rice or soba noodle. Then choose a combination with salmon, tuna, tofu, crab, King fish, fried chicken or beets. All signature bowls are topped with furikake, nori, crispy taro and shoyu. My sister very much enjoyed the 'King'fish with Heirloom radish, jalapeño, zucchini, ka'ukama, edamame, cabbage, pickle ginger and wasabi mayo ($16). I loved my pick which featured tofu and was packed with fresh salad ingredients and lots of flavours, including both fruit and vegetables, dressings and garnishes. Poke signature bowls are from only $14. The food is piled high in the bowls and the presentation is stunning. Each meal is hand made to order. My sister commented that they were exactly the right size, they are not heavy and don't leave you with the overeaten feeling. They were truly delicious. 'It's how I imagine you would eat in a really cool restaurant in Hawaii. Breakfast is served until 11am (all day weekends) such as Hawaiian Pancakes - banana with maple and coconut syrup ($16, with bacon add $4) and Hula Waffle with pure maple, bacon, house ice cream and macadamia crumble ($18). 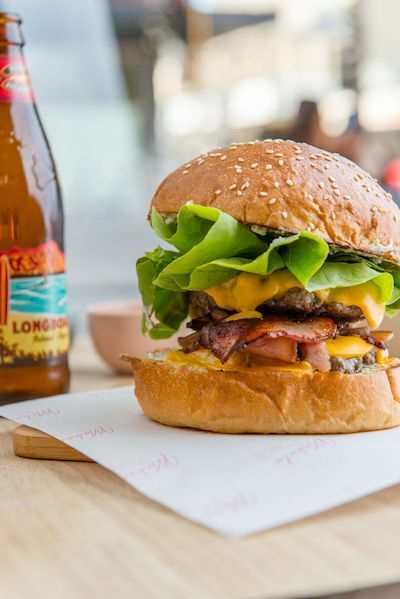 They serve burgers, sides and snacks such as crispy fried taro chips with chilli salt ($6) ,which I can personally endorse and an array of interesting drinks, for eg, Kona Big Wave Golden Ale $10 Kona Longboard Island Lager $10 and their own labelled cocktails in cute little jars. Watch out they are deadly. Coco Dragon - Dragonfruit, mango, chia, coconut, buckinis, cashew, honey and coconut milk. Choc Nana - Organic Raw cacao, banana, pure maple, peanut butter, organic maca, cinnamon, almond milk. Berry Nice - Acai, blueberries, raspberries, banana, oats, organic yoghurt, honey and coconut H2O. 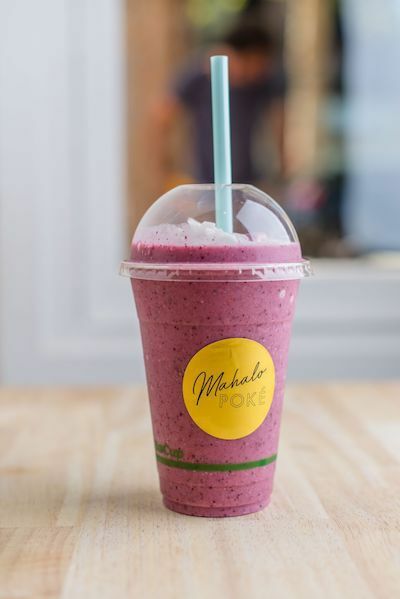 Mahole means appreciation, so I would like to extend my thanks to them for a delicious 'guilt free' indulgence. 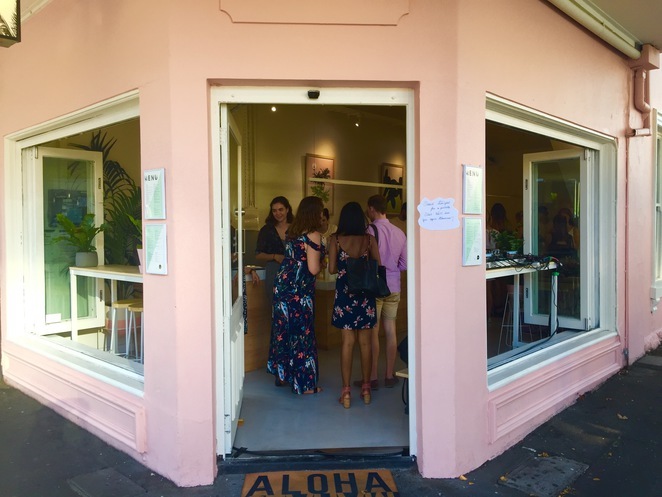 Plenty of others are also expressing their thanks to Mahalo Poke by lining up in long queues of people at certain times of the day… don't be the one to miss out! Looks fantastic! Congratulations on reaching your 500 - that's an amazing achievement!